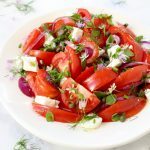 Easy tomato onion salad recipe Mediterranean style with lots of fresh oregano, chives, capers and feta cheese, dressed in a lovely olive oil and red wine vinegar dressing! I’m having a major crush on all the heirloom tomatoes this summer, today I’m particularly fond of the red ones. They just scream hot summer days, deliciousness and freshness! 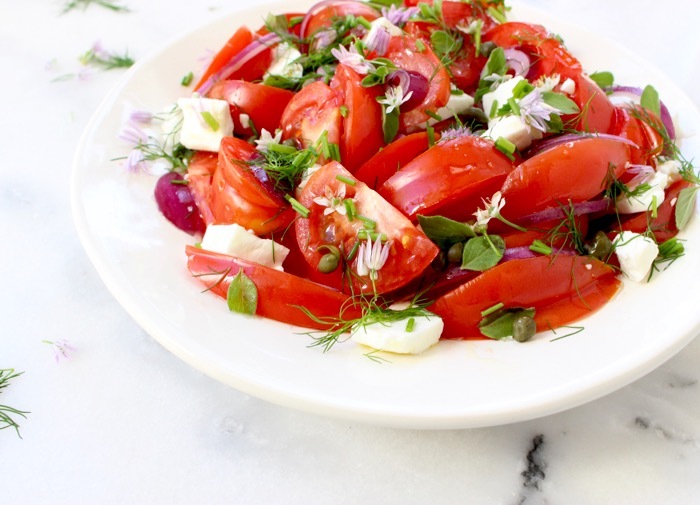 Ok, do we really need a post on how to make a simple tomato salad ? Uhmm… well.. yes of course, what kind of question is that ..? Italian style: dressed with basil pesto and fresh mozzarella. 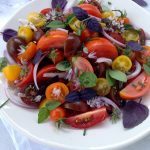 Heirloom tomatoes, thyme and goat cheese <–Gotta try that! Drizzled with a balsamic vinegar reduction. Mixed with cucumbers and scallions to end up with this lovely thing. Latin style with cilantro, chili and lime. I just love adding those adorable chive blossoms on top, it compliments the final dish with subtle sweet onion flavors, and just makes it look pretty. We already agreed that pretty food taste better, right ? So, If you have any growing in the garden, sprinkle them all over the place. Tomatoes taste amazing and are a rich source of lycopene. They are also loaded with vitamins and lutein which helps with healthy vision. Who does’t wanna see well, right ? 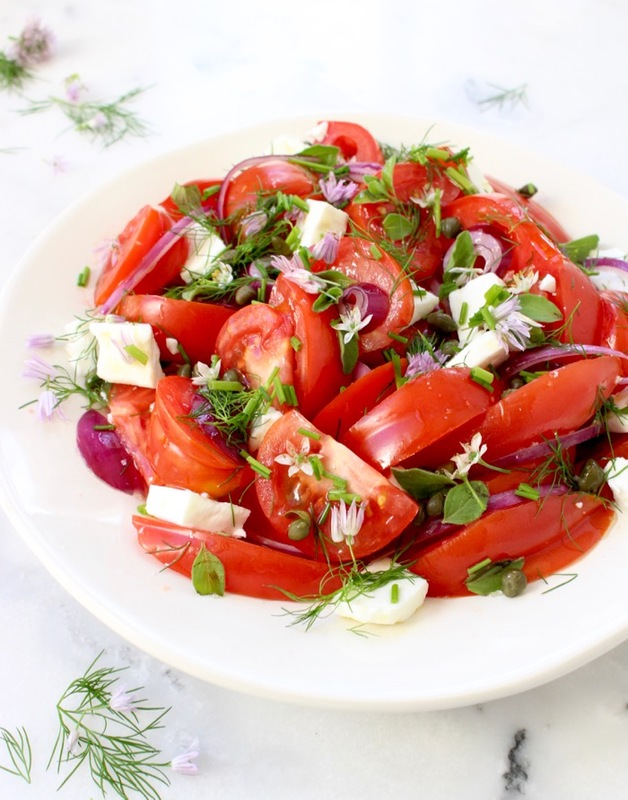 Simple tomato onion salad recipe Mediterranean style with lots of fresh oregano, chives, capers and feta cheese, dressed in a lovely olive oil and red wine vinegar dressing! Using a very sharp knife slice the tomatoes into small wedges and add them to a serving bowl with the capers. Slice the purple onion into thin strips or round and sprinkle on top of the tomatoes. 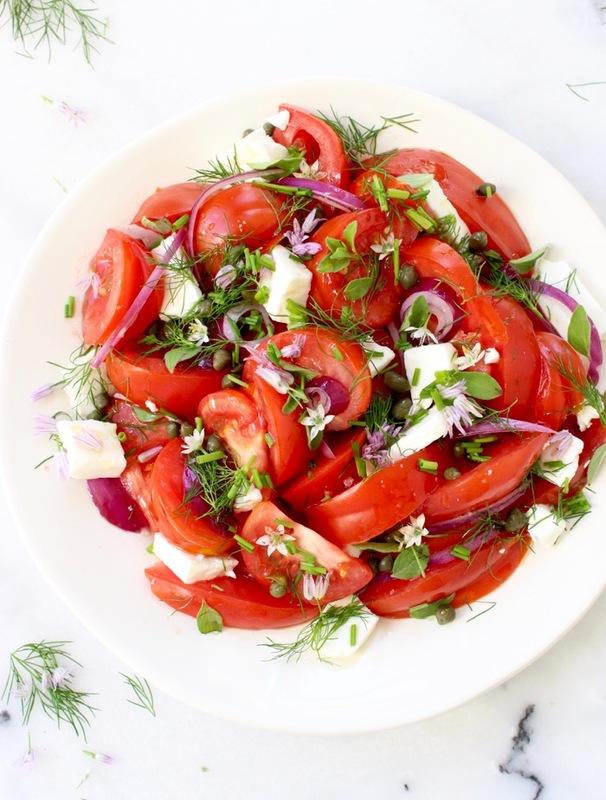 Use your hands and rustically tear the feta cheese over the top of the tomato onion salad. Sprinkle with the fresh oregano, dill and chives. 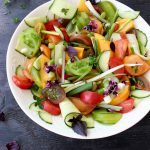 Drizzle the salad with the olive oil and red wine vinegar. Season with the Fleur the Sel sea salt, and just before serving give it a gently toss to coat. Garnish with the chive blossoms and serve promptly with a few extra flakes of Fleur de Sel on top to your taste. Yes please! This sounds amazing! 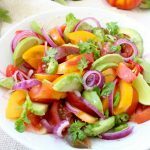 I just harvested a ton of tomatoes from the garden, and this salad will be the perfect way to enjoy them! This sounds wonderful, and perfect for summer! Mmmm yum, this salad looks delish!! I’d get seconds of this dish for sure. I could just stare at the feature photo. It’s in fact what I’ve been doing. So beautiful! We just can’t get enough of this tomato salad. 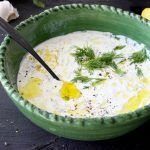 Use an imported feta in brine, absolute perfection!